There’s been much local Chicago hype surrounding two acts on this night’s bill. As the crowd piled into the Empty Bottle, I wondered if this second dose of Kid Sister and Cool Kids would be better in a club setting, supported by a pair of French DJs and grounded by turntablist phenom DJ A-Trak. 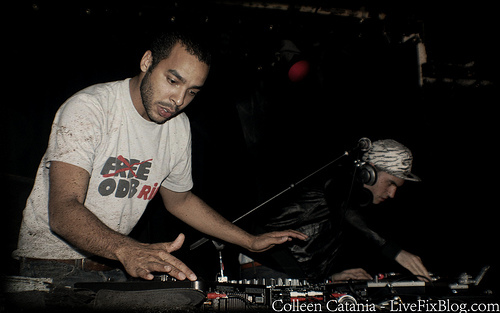 Fools Gold label co-founder and Canadian-native Alan Macklovitch (aka DJ A-Trak) got started rocking club crowds with his mix of turntablism and dance beats at a very early age. In 1997, at 15, he won DMC’s World DJ Championship and after Kayne West discovered him in a French nightclub, he later found himself anchoring Kayne West’s 2004 Late Registration tour. 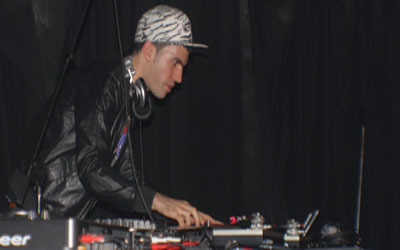 A-Trak is part businessman, DJ and producer and at any given moment during the show any one of those roles can take control. He scurried back and forth from the stage to the back of the house as he sat behind the DJ table during the Cool Kids set prepping himself to provide the beats for girlfriend and Fools Gold artist Kid Sister. Watching the business/label-owner side of DJ A-Trak meander around the venue in his tilted zebra-striped baseball cap was interesting to watch but I came to see him work the decks and the crowd and experience what he’s like in a live setting. When he jumped on the controls of his laptop and turntables all my questions were answered and few new ones arose. Certain acts and music go over better when experienced in the right surroundings. The beats of a live DJ usually feel, sound and absorb better into your eyes and ears when it’s dark and the club’s capacity is kept to a tightly packed 200 people who have come to dance and be swept away in a communal expression created by a building buzz and hype that’s all brought to a peak by the melodic alchemy of the DJ. 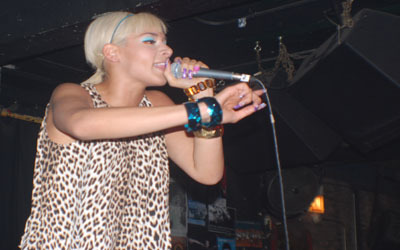 Having seen both female rapper Kid Sister and hip-hop duo Cool Kids at the Pitchfork Music festival and Lollapalooza earlier this summer I wasn’t completely blown away by what I saw. But I simply checked it off as a case of location, not lack of talent. When I soaked up the Cool Kids’ mix of chop n’ screwed meets crunk-filtered Beastie Boys back in July I was split down the middle. I had a hard time seeing what new slant they were bringing to the hip hop game even though the duo is definitely the start of something fresh and creative. But unfortunately as this set rolled on, the beats got repetitive and predictable and fell flat and awkward. Moments of spontaneity experienced at Pitchfork were few during this set. Although it was a raucous set, it felt out of synch and lacked the same block rocking energy, not because of lack of style but it seemed like the guys were tour weary. Prior to this show they had just completed a string of shows at the CMJ musical festival in New York in addition to other Fools Gold stops. 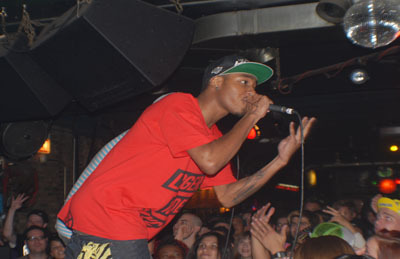 Mikey rapped with a sly tongue-in-cheek manner, admitting their music is the “new black version of the Beastie Boys.” The ability to laugh at themselves makes the Cool Kids more than just a novelty act and their songs are a potent and playful poetic journey through a cartoonized and humorized version of an inner city ghetto. They dropped the hit track “Gold and a Pager” and a new track that Mikey was busting at the seams to share so much that he halted the previous song just so he could squeeze it in before the set wrapped up. Fighting off apparent tour exhaustion, the Kids dug deep and gave the hometown crowd a chance to escape into a welcomed moment of cathartic silliness and then tossed the mic to tourmate Kid Sister. The DJ ruled the night as the tunes poured out of the laptops, onto the spinning decks and out of the speakers as French DJ Mehdi and DJ Kavinsky took the show deeper into early Monday morning. A-Trak has Fools Gold on the right path and some of the hype is warranted. Future gems are lurking just under the surface and if they’re mined from bedrock in just the right way they could shimmer and sparkle in the sunlight beyond the subterranean soil of the nightclub.